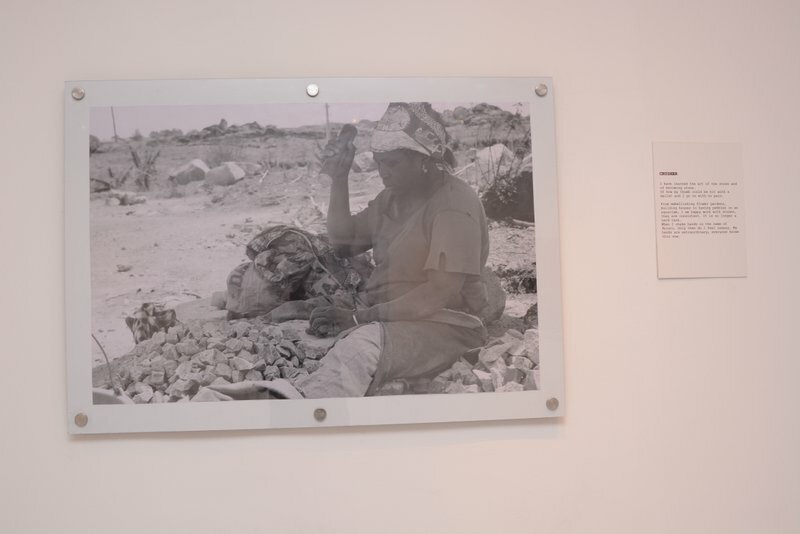 A few weeks ago photographer and playwrite Zainabu Jallo exhibited her series of photographs as part of a commemoration of International Women’s Day. 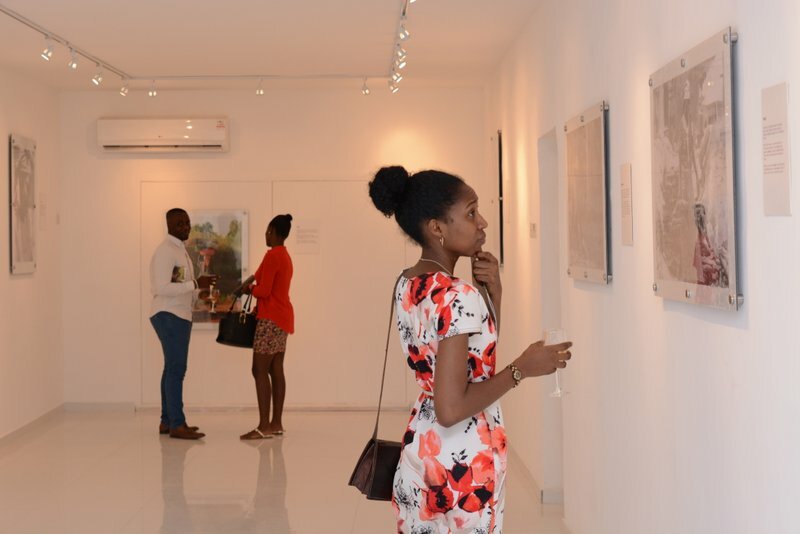 The exhibition titled ‘My Street Economics’ curated by Adenrele Sonariwo ran from the 8th-22nd of March at Rele gallery in Onikan. I got the opportunity to interview the artist. This interview was originally published as a part of the exhibition brochure. Often times most photographers just aim to capture the image of the subject. You also talked to them. How did this help to frame the project? Taking photographs of subjects, objects and situations was and still is a process of information assemblage I engage in as a playwright. Rather than imagine stories about the subjects it was a gratifying experience to speak to these women, most of who were self-assured. Their words needed to be incorporated into the project. They are precious. Story telling is hugely subjective but you indicate that with ‘My Street Economist’ you were striving to achieve a sort of balance. Were you able to achieve that and how? An attempt at some kind of balance remains the genuine intention; candid images, candid words, versus world- view. All factors elemental towards attempting a three-legged pot, placed on the table. A balance now would be seen or unseen in the eyes of the viewer, based on individual /prior knowledge and stance in perceptions. Personally, the distortions are minimal towards finding a balance. The stories from both sides of the coin are familiar ones. What still strikes me about these women is the level of contentment laced with hardwork. These women do not seek any class-consciousness or go to sleep hungry. Something I notice about the images was a sense of ownership of their trade from some of the subjects. They didn’t seem sad or bereft or disempowered as these sort of subjects have typically been portrayed. Was that done deliberately or was it something you discovered while photographing and interviewing them? Moments were initially captured unstaged. I would sometimes hide in a corner or in a tree and then meet with them afterwards and confess to my invasion (those who didn’t want to be a part of it had images of them deleted before them). There is something about staged moments that is discomfited to the kind of projects I do, especially with documentary situations. I definitely discovered this “sense of ownership” with admiration in the cause of photographing and talking to them. We can’t talk about this project without discussing women. Do you think women’s contribution to the informal economy is not given as much relevance and significance? What are your thoughts? Societies differ as to which areas they choose to highlight in development issues, I wouldn’t refer to it as “informal” it is the many drops which travel the way of the ocean. With the UN’s announcement of MDGs in 2000, a good number of NGOs and government projects have been committed to “women empowerment “ and made efforts to incorporate women empowerment-one of the MDGs -into policies. In this regard, there was awareness on women’s potential contribution towards a more vibrant economy, the question on how successful these attempt have been remain relative. For most of these women, survival through trade is fuel to their fire and not recognition to their cause. I would be wrong to assume they are waiting for a messianic hand, let alone recognition. The debate on whether they are well acknowledged or not is on- going. Regardless, they are. I like the multiplicity in terms of empowerment. Empowerment doesn’t have to look like just a woman in a suit. What were your own discoveries photographing and talking to your subjects? Oh, indeed, there are different faces of empowerment and undoubtedly every single one of these women is empowered. Working to provide dinner, one which you, the provider, shall cook among other things is akin to conquering an army. A woman who understand her self-worth and equally selfless towards others, working with no reservations about who provides what, when and how, but quietly goes about her business with no grudges. The texts are very poetic and so is composition in the images.The landscape,the produce, the people. But most of all its a banality that we walk past everyday but the portraits capture a depth that we easily don’t think much about. Why the poetic choice? My worldview and the processing of it, is in poetic form. My translations also usually are. I have to agree that this isn’t how everyone else sees it. This is in no way an avenue to romanticize the situations but this is in an attempt to tell the unspoken story. What is the ultimate goal with this project? To share the facets of the beautiful and the inspirational, those we look at but fail to see. Taking a closer look at this project how do you think a better understanding of the economic systems of smaller communities can contribute to socio economic growth on a larger scale? For societies such as ours with a good number of the population tucked in smaller communities, it is very obvious that large-scale industrial farming would make monumental impact (I speak for Nigeria). As it were, smaller communities contribute mainly towards agriculture which is still manually carried out. Understanding that they can produce more volume in less time with less labour is transformative; undoubtedly an economic booster. Imagine a system of mechanized farming throughout Nigeria. You know, in spite of the endless fertile landmass, it cannot feed 1/8 of the population without importation of food that can easily be produced here. This is another major topic on its own. Surely, these economic systems are well understood. Implementation is all it takes. It is women’s month and we are certainly in a time where the paradigm is shifting albeit not as fast as we would desire but what does being a woman mean to you in these times? The theme of this year’s celebration by the UN is: “Empowering women, Empowering humanity: Picture it!” The growth of women in powerful positions have unquestionably escalated with the turn of the century. In some societies these are the hardest times to be a woman, one who can get an education, one who can speak and be heard, one who has aspirations and can confidently work towards them. We are caught in a web of extremities and the patch of the planet you find yourself as a woman is the determining factor. Being a woman in these times, to me, means being able to swim in deep waters knowing that you are your own life guard, and rescue boat.